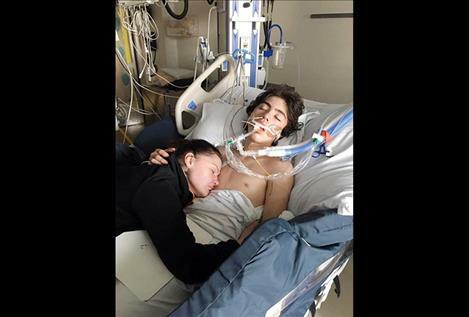 Lucas Clark, 14, of Ronan, was admitted to the hospital on Jan. 11 for a life-threatening illness. His mother, Kendra Schiele, said Lucas stopped breathing and was ventilated. He was then moved to the pediatric intensive care unit in Missoula. “They didn’t know why he was having lung failure and violent spasm,” Schiele said. Lucas was flown to a Seattle children’s hospital to undergo more testing. He was then treated for tetanus with sedation and muscle relaxers. Schiele said the medications eventually stopped working. On day 11, Lucas had been ventilated four times and almost died three times. Lucas was doing so well that he was sent home on Feb. 1. “The best part about going home is bringing my recovering son with me alive,” she said. He will need physical therapy and many more medical based trips while he recovers. Donations to help with travel expenses are being sent to Kendra Schiele at 806 Dayton, Ronan, MT 59864.